Looking for inspiration for your kitchen? 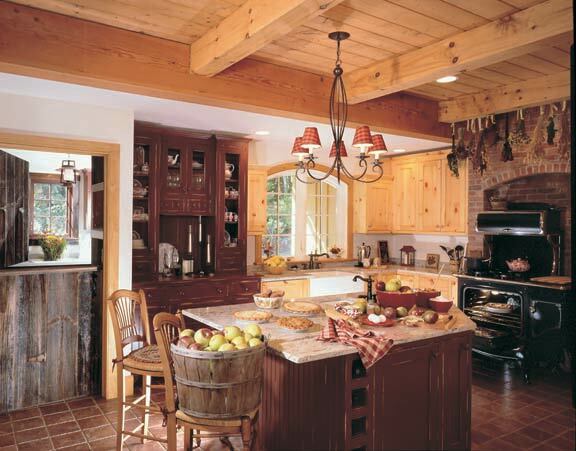 Check out our favorite photos of country kitchens from 10 timber frame homes. Distressed barn-red accents and a Dutch door lend charm to this country kitchen. What constitutes a country kitchen? It can be elegant or rustic, but it will typically have beadboard or knotty wood cabinets, turned table legs, painted stools, old signs (sometimes), plaid curtains, an old-fashioned stove and a farmhouse sink. The appliances won’t look modern, even though they probably are technologically up-to-date. And look for floor boards to be full of knots or covered by an oval rag rug.